Wild: Megatherium Formipavor is one of the larger mammals on the island. This is most shocking because it is essentially a giant sloth… if you crossbred it with an elephant and a bear! Because of its size and girth, the Megatherium is uncommonly resistant to being knocked unconscious. Domesticated: Megatherium is an incredibly useful creature to tame, so long as you don’t intend to fight other tribes. Its enormity, high resistance to torpor, and voracious attitude toward insects (and arachnids) makes it ideal for farming large quantities of chitin from the bugs of the island, or simply defending against them! Known Information: Despite primarily being an herbivore, a typical Megatherium is very intent on consuming the island’s many insects. It is particularly adept at removing their insides without damaging the shell, maximizing extraction of chitin. 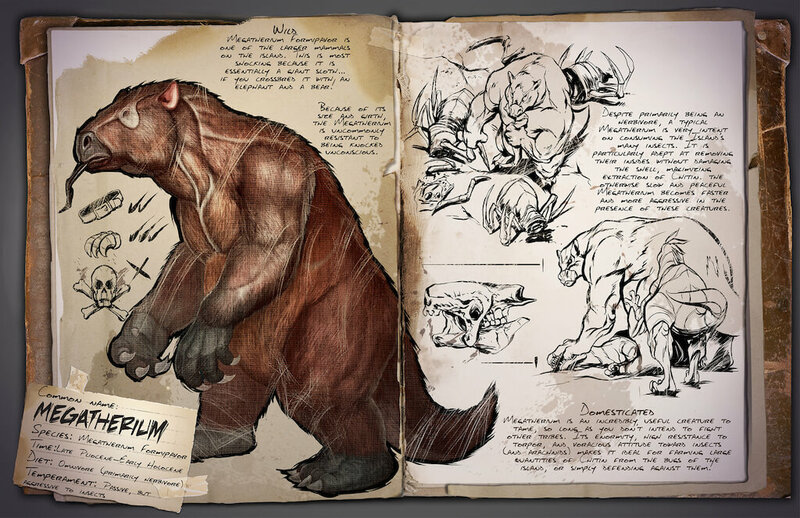 The otherwise slow and peaceful Megatherium becomes faster and more aggressive in the presence of these creatures.